Hello again readers! This time in our cafe review series, we will be covering the Card Captor Sakura Fantasy Cafe as voted on by our valued readers in our Twitter poll back on July 16th. 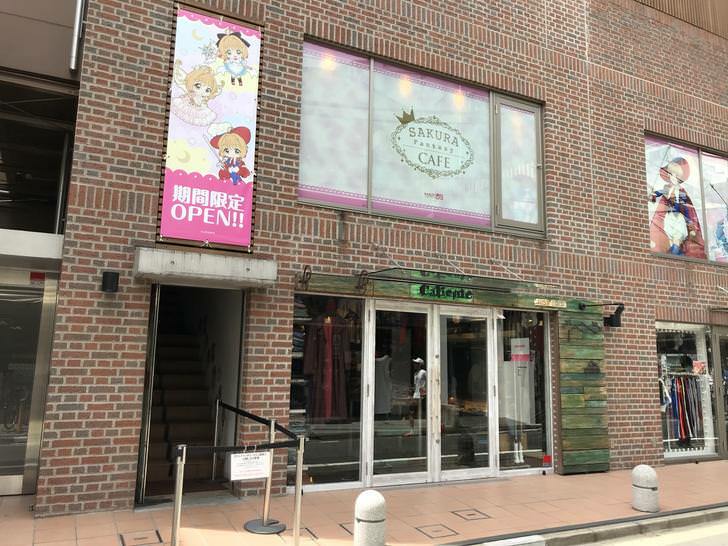 This Card Captor Sakura collaboration cafe iteration was hosted in three places – one in Harajuku, Osaka, and Saitama. Our visit centers around the Harajuku location. This café will only be held for a limited time from July 12 - September 30, 2018 until further notice. Reservations were required at least three days in advance via the cafe's website (which also needed a free account registration to do so), and the booking also included an exclusive luncheon mat which were given upon entering the cafe. Numbered tickets for the merchandise corner were also given at the reception for customers to use once their number was called during their session. The process for entering the cafe required logging on to the site the reservation was made on and pulling up the reservation detail page on your phone or tablet, whereupon the reception staff would make a digital stamp onto said page, clearing you to begin your session. The placement of the cafe was rather straightforward and easy to find, being roughly a seven or eight slow-walking minutes from Harajuku Station. Having chose the earliest time frame we could for our session (11:00~12:20), the cafe was sparsely populated at the time of arrival. The cafe required ordering from the menu to be done before entrance via a form system, and their rules also indicated for each individual to order two or more items from the food and dessert menu combined. Our choices were the Sakura and Syaoran's Close-Knit Cheese Toast (さくらと小狼のなかよしチーズトースト), Sakura-Pink Fluffly Shaved Ice (さくらピンクのふわふわかき氷), and finally the Wonderland Fantasy Drink (不思議の国のファンタジードリンク). Decor of the cafe was semi-simple but well done, with two projectors looping clips and ads for the 4K remaster release of the original anime series, the sound system was playing tunes from the show and there also was a small display case of toys showcasing replicas of the staff and cards used by Sakura herself in the Clear Card Arc released by Takara Tomy. The Cheese Toast was essentially a nicely made grilled cheese with crisp, pastel colored toast and a equally binary colored cheese of ample amount served on a large platter with a small omelette also topped with a green-and-pink sauce (keeping with the two-toned theme of the dish) that actually tasted differently between each colors, and a light serving of salad drizzled with dressings. The garnishes were a printed wafer of the stuffed bears that Sakura and Syaoran traded between each other, and a small pick sign of the cafe. Lastly came the shaved ice, which we had ordered for to arrive at the very end. This dessert, was massive. It was very literally a parfait-inspired monument of strawberry on top of strawberry flavors lined with everything else strawberry, and at the summit of which sat Sakura herself, in printed large wafer form with an almost deity-like fashion. Though as overwhelming this finale seemed in scale, it ended up being the perfect and most appropriate of item for the hot and humid morning we had to suffer through getting to the cafe. We actually surprised ourselves with how quick all of it was consumed. As venture was made towards the end of the dessert, a slightly small portion of fruit cocktail mixed with nata de coco cubes were found, giving a excellent end note to our experience. As with our previous and initial acquaintance with a CCS collab cafe this one was no less in quality. Interior decor was well put together, and the food was very excellent. We will be definitely looking forward to the next Cardcaptor Sakura collaboration cafe iteration, wherever it might be held.